Click the button below to add the Mimaki CJV30-160 Pen Line Rubber - SPC-0554 to your wish list. This Pen Line Rubber 30-160 is suitable for Mimaki CJV30-160 & CJV30-160BS printers. 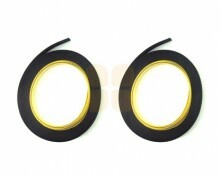 This is the original Mimaki part (number SPC-0554). This product is 171cm long and 0.9cm long. This Pen Line can be trimmed down to fit other printer models.